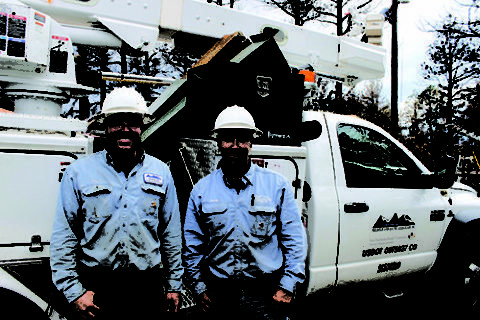 Bryce Myers (left) and David Lagge were two linemen who helped evacuate people in the path of Colorado’s Black Forest Fire in spring 2013. “Legends on the Line” is a blog series that stretches from National Lineman Appreciation Day (April 18) to Lineworker Appreciation Day (July 10) in honor of the brave linemen and linewomen who climb above and beyond to power our world. The following blog post was drafted in partnership with Basin Electric Power Cooperative. It started off as a normal day in spring 2013. David Lagge and Bryce Myers, linemen based out of Mountain View Electric Association’s operations center in Falcon, CO, worked side-by-side outdoors, handling routine meter maintenance. The two were in the midst of a resealing project when they first saw it. “We noticed black smoke,” Lagge says. At first, the men weren’t sure what to make of the billowing stack as it crept toward the broad-day sky. They entertained the possibility that the smoke could have been coming from outdoor equipment somewhere in the distance. But, they couldn’t ignore the more frightful possibility. “We decided if it was a fire, we better get down in there,” Lagge recalls, adding that he and Myers thought it best to shut down power if flames had already started eating through the dry, forest-like terrain that covered them from all sides. The men jumped into their service truck and headed toward the rising dark cloud. As they drew near, Lagge and Myers’ original fears amplified as they gazed upon a mobilized crew of firefighters frantically battling a blaze that had gotten out of control and was burning rapidly throughout the landscape. “We asked the firemen what we could do to help,” Lagge says. 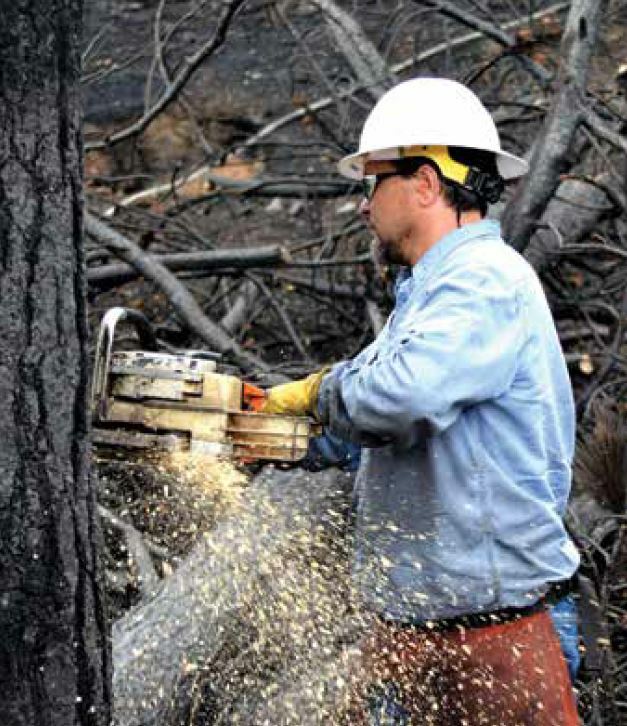 In an effort to restore power to certain areas after the Black Forest Fire moved through parts of Colorado, linemen were forced to clear burnt trees that were in the way. Seeing that the firefighters couldn’t afford to turn away from the blaze for more than a few moments, the linemen’s attention shifted to the direction the flames were moving. The fire began to whip toward a host of residential areas where people sat indoors, unaware of the imminent threat at their doorstep. Lagge and Myers leapt into action. They recall sprinting door to door, warning bystanders of the fast-approaching flames and leaving red ribbons at home entrances, to let authorities know which households had been alerted. Sirens began to echo in the distance, and the linemen knew it was only a matter of time before the area they were canvassing could be engulfed in the blaze. Some of those who answered their doors were unaware of what was happening, and a portion of people who began evacuating the area stopped short upon realizing flames had already jumped their main access road. Nervous residents halted at the sight of a lost escape route. But Lagge and Myers knew a way out. “Being we’re up there virtually every day, we know the backroads to get around in there, and a lot of those folks didn’t, so we were able to help people out that way,” Lagge says. With only minutes to spare, people fled their homes. However, having not yet witnessed the incoming fire, many questioned the urgency of the threat. 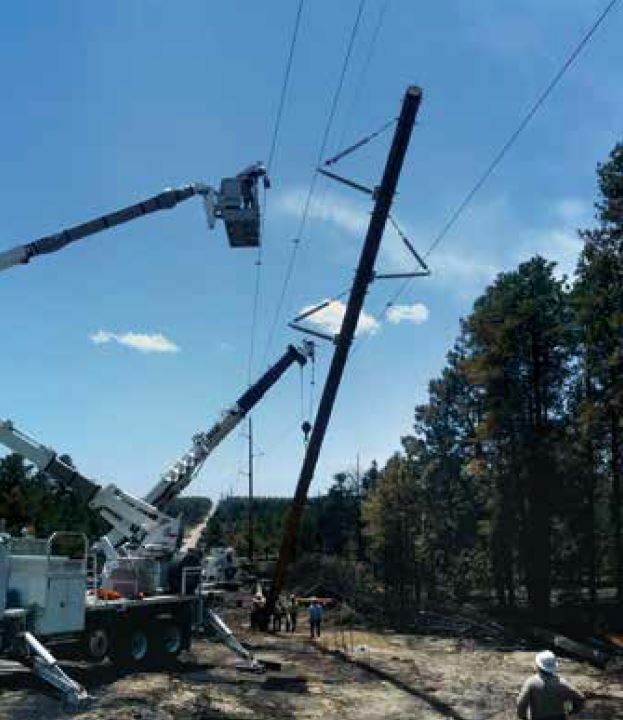 Linemen tend to poles and line damaged from the Black Forest Fire. “For most people, it was stress and worry and skepticism,” Lagge says, with Myers adding that some people worried about what to take with them in the short amount of time they had. After the duo made sure folks knew what was happening, they bolted for their truck, where flames were already closing in. As they worked to leave the area, Lagge and Myers stopped upon noticing two dogs, a Labrador and Doberman, sitting in the front yard of a home in the line of destruction. They immediately got out of the truck and called to the dogs, and the Labrador darted over and jumped into the truck. The Doberman, however, wasn’t as eager to get in. Thinking on his feet, Myers whipped out his lunch, in hopes of attracting the Doberman into the truck, but the dog wouldn’t budge. Eventually, the men were able to safely and carefully pull it into the back of the truck. Shortly after the group left the area, flames engulfed a camper and two outbuildings the dogs had been sitting near. The fire also devoured entire homes, trees, vehicles and anything else in its path. But, the two linemen made it out, eventually reuniting the dogs with their owners. The days that followed were brutal, with 16-hour shifts being taken during electrical recovery efforts. But ultimately, Lagge and Myers are just glad they were able to warn so many people in time. How to wear a disposable respirator maskWin a FREE YETI cooler!